Leaders are not born, they are grown. It takes hard work and practice to develop leadership skills. Unfortunately, the most popular method of educating youth today is to ask them to sit down, be quiet, listen and write. At Cub Creek, we believe the best way to grow leadership skills is through practice! The ASIT program was created with this idea in mind. We give high potential teenagers the opportunity to see, learn and apply leadership skill in the fun and safe environment of summer camp. Our ASITs are role models and are looked up to by our campers. Because these teens are expected to lead by example, take on responsibility, and exercise independence, the ASIT Program is invitation ONLY and highly selective. One of the favorite aspects of the this program for many ASITs is the time spent with camp's animals. Over the course of a session, our ASITs can gain experience with an incredible variety of animals. ASITs assist our Animal Team each morning with taking care of camp's 300 animals. They learn basic care and feeding skills within this time we call "Morning Rounds". ASITs receive special hands-on training at the start of their session and throughout their stay; This one-on-one training is not offered to our other campers. 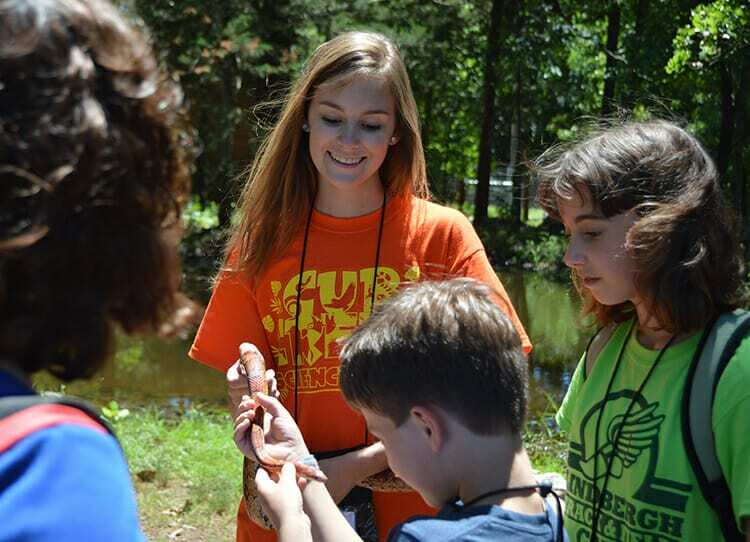 During activity periods, ASIT assist the younger campers in learning about and interacting with our animals. And because ASITs are trained in the safety of our animals, they are trusted to spend one-on-one time with our animals in their free periods! Teens must be shown how to lead, and that is exactly what the ASIT program is all about. We are dedicated to setting our ASITs up for success! The leadership training that ASITs receive begins before they arrive at camp. In the months leading up to summer, will start their pre-camp training. To start, ASITs will be sent an ASIT manual. This guide is full of useful information that they should carefully read before their session start date. We will also set up training videos for ASITs to watch online that will be tailored to topics they will face at camp. These videos are specific to topics like "Being an Effective Leader" or "Becoming a Role Model". These videos are also pre-camp training tools we use for our summer camp staff! We help our ASIT build confidence through preparation. To help them prepare we have developed a special ASIT orientation that begins one day earlier than our typical camp sessions. During this orientation, ASIT will bond as a group, learn each others names and interests, get a sneak peak of all the changes that have happened at camp in the last year, and practice skills needed to put them comfortably into a leadership role from the moment campers arrive the next afternoon. ASIT are asked to come to camp the day before camper arrive, so that they can benefit from a pre-camp ASIT orientation. After instruction and with supervision, ASIT are given many opportunity during their session to take on a leadership role at camp, including assisting instructors during class time, supervising a designated area during free time, leading group games with an adopted cabin and much more. 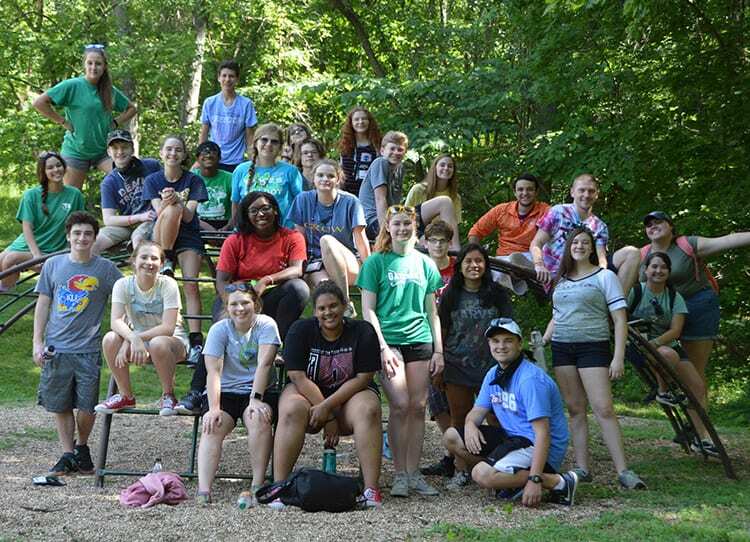 ASIT Drop Off is the Saturday evening of their session, from 5:30 p.m. - 6:30 p.m.
What Does an ASIT Gain from Camp? When an ASIT leaves Cub Creek Science Camp at the end of the summer, our ultimate goal is that they are a more confident, skilled, and compassionate individual. We believe that day-to-day, camp creates incredible individuals who naturally become more confident after being able to get 16 kids to sing a silly camp song with them; more skilled after learning how to halter a camel; and more compassionate after helping a camper overcome homesickness. But we work very hard to intentionally work skill building into the ASIT Program. Just as important as our ASIT orientation, in preparing ASITs for their role as leaders and role models at camp, is ASIT role on the departure day of each session. On departure day, ASITs take on the role of camp ambassador and area supervisor. They are given the opportunities to practice public speaking and boost the self esteem of campers and themselves as they answer parent questions and share inspiring stories with the families who tour camp with their campers. ASIT practice for this role throughout the week, but nothing quite measures up to the real thing of talking with and impressing hundreds of adults through your words and manners. Former ASITs over the years have gone on to do amazing things. They have used their gained skills to apply for Veterinarian School, Animal Internships, and Prestigious Universities all over the country! Our ASIT team is incredibly hard working and has many responsibilities that help us make camp what it is. Because of this, we believe ASITs deserve opportunities to rest, enjoy their own camp experience, and spend time with their fellow ASITs. ASITs have smaller privileges like having their own break/meeting lounge and being allowed to keep their electronics/cell phones while at camp. But we have planned activities for ASITs to have their own unique events. ASITs have special time scheduled for their enjoyment of the ropes course and a special training hours each evening in the animal area. In addition, one afternoon each session is spent away from camp on a special ASIT bonding activity. These special day events are planned as a way of showing appreciation for our ASITs and are intended to encourage group bonding. ASITs are a cherished part of our camp community. They are the bridge between the camper experience and the staff experience. It is important to us that while we are grooming skills in these beloved campers, we are also providing them some perks! The ASIT Lounge. ASITs are given a lounge as a meeting space and an area to relax on their breaks. This space was given to our ASITs in 2013 and has been a wonderful addition to the Program! The lounge is supervised by the ASIT Leaders and is a place for ASITs to work on projects, relax, and spend time together. The lounge also offers a space for the ASITs to keep their snacks and electronics. Cell phones. A huge part of being at camp is being "tech free". We believe that in order to be able to experience camp to its fullest, you must be willing to not hide behind a screen and step outside of your comfort zone. Campers do not have their phones to help them get into all that camp has to offer without the distractions of technology. We want the same experience for ASIT. Yet, because they hold so many responsibilities around camp, we want them to be able to contact their ASIT Leaders, the Animal Team and Camp Management if they needed. ASIT Afternoon Out. In addition, one afternoon each session is spent away from camp on a special ASIT bonding activity. This activity has evolved over the years to be focused on bonding. These special day events are planned as a way of showing appreciation for our ASITs. ASITs wait all year to come to camp, so the last thing we want to do it spend a whole day away from camp! You will find colored dots to signify availability for boys and girls in each ASIT session. When a red dot appears, you should call prior to registering. Red indicates that this session for boy/girl is very close to closing and spots may have been filled. Black indicates that session for a boy/girl is filled and currently only taking waitlist registrations. Please call for any questions you may have! *A non refundable deposit of $250 per week is required with each registration. We cannot guarantee your space without this deposit. To see how each ASIT session corresponds with a Cub Creek camper session, look at the table below. Combine two weeks at Cub Creek in the ASIT Program with two weeks on the island of Jamaica! Please see the chart below to plan arrival/departure of an ASIT. Times in YELLOW are our preferred times. Remember that ASITs arrive and depart from camp on Saturdays. 11:01 A.M. - 11:59 A.M.
3:01 P.M. - 4:00 P.M.
4:01 P.M. - 5:00 P.M.
5:01 P.M. - 6:00 P.M.